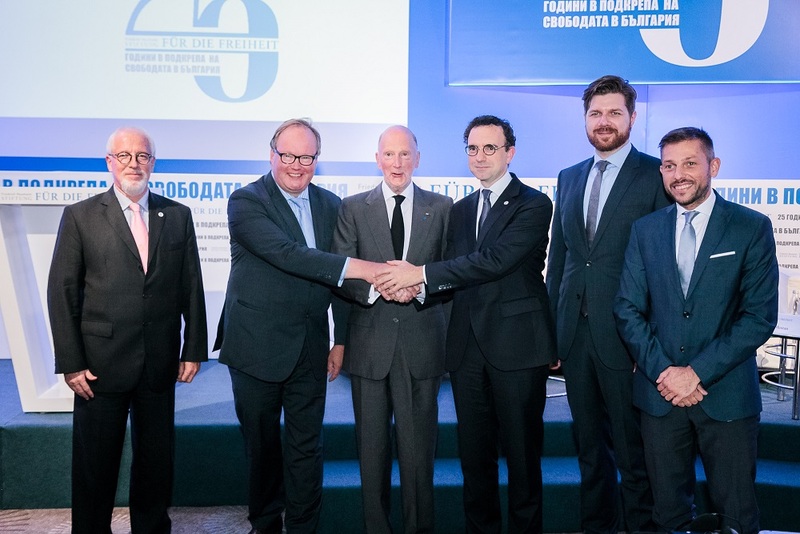 For 25 years now, FNF has been supporting the establishment of liberal democracy in Bulgaria in a close collaboration with a large number of partner institutions and liberal friends. A lot has been achieved for country`s good governance and market economy, but there is still a lot way to go further! The liberal-minded and active civil society will play now a decisive role. 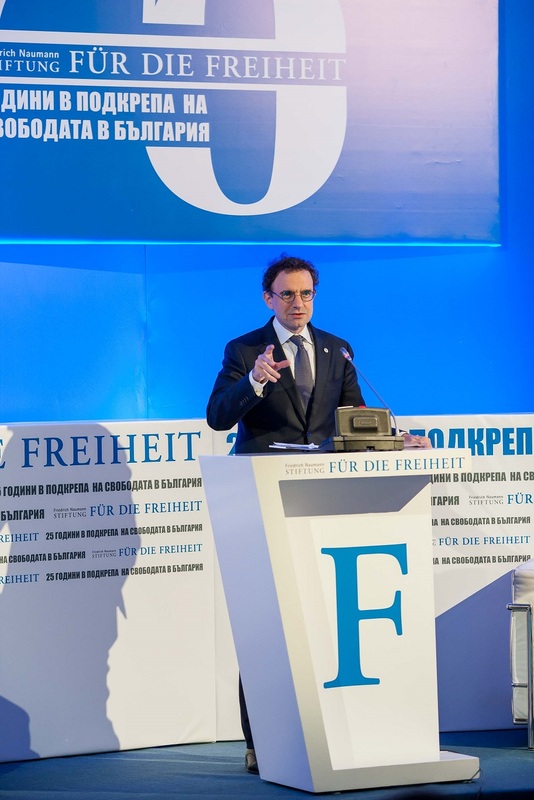 The Friedrich Naumann Foundation for Freedom was the first German political foundation, which supported the process of democratic transition in Bulgaria from the very first days of the regime change in 1990. 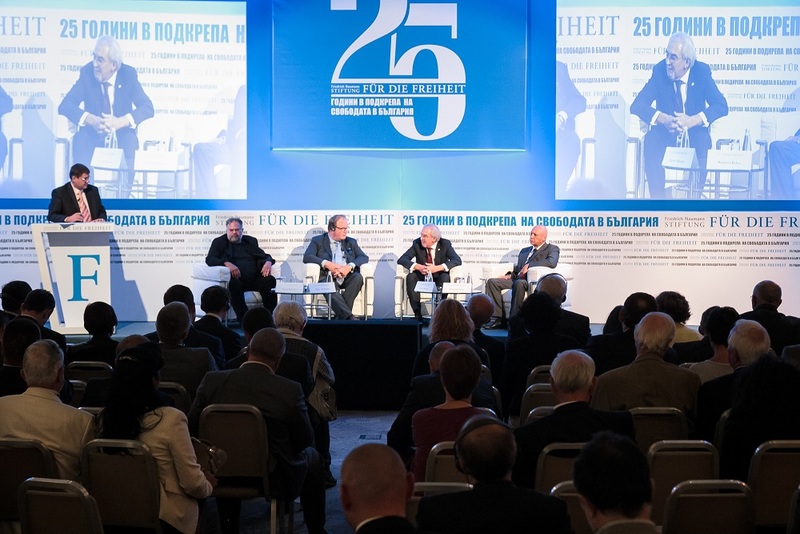 To celebrate its 25th anniversary, on 17th September 2015, the Project Office for Southeast Europe of FNF hosted an international conference “25 Years Promoting Freedom in Bulgaria”. 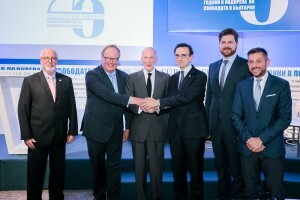 In the largest liberal convocation in the country, dignitaries from Bulgaria and Europe discussed the years of transition towards democracy and market economy, and the role of the liberals in this process. “Liberalism is active and vibrant in Bulgaria, but there is still a lot way to go further. The building of a liberal-minded civil society, who does not rely on the state for the provision of prosperity, is the core of the democratic process, but it takes a lot of time, even decades to be achieved”. With these words Prof. Karl-Heinz Paqué, Vice President of the Board of Directors of the Foundation, opened the event, giving the floor for welcoming remarks to Vesna Pusić, First Deputy Prime Minister and Minister of Foreign and European Affairs of Croatia and Meglena Kuneva, Deputy Prime Minister for European Policies Coordination and Institutional Affairs of Bulgaria. Before the two discussion panels, Rumiana Kolarova, Secretary of the President of Bulgaria congratulated the Foundation on behalf of the President Rosen Plevneliev. In the first panel, devoted to democratic development, Lyutvi Mestan, President of the Movement for Rights and Freedoms (MRF) party, highlighted the enormous contribution of the FNF to the transition process in the country and the liberalisation of MRF, which “did not take the path of an ethnic party, but thanks to the support of FNF, chose to be a liberal one,” now being amongst the most popular in the country. Liberalism in Bulgaria, however, likewise at European level, has been suffering due to a breakthrough of populist, often radical right and left-wing politics, with no rationale behind. In the tough times of transition, those forces easily took over, undermining the establishment of true democracy and the rule of law. It is exactly the liberals, who were in government between 2001 and 2005, and who scored the landmark success of the last 25 years – namely, the country’s accession to NATO and the European Union. Stanimir Ilchev, current Co-President of the ruling at that time NDSV party and Deyan Kyuranov, one of the first employees of the Foundation, recalled that fact. “If King Simeon II was not in power in those crucial times, leading a liberal government, I am sure Bulgaria still would not have become member of the European Union,” pointed out Hans van Baalen, MEP and Vice President of the ALDE party, and continued with how dangerous that could have been for the entire region, having Russia’s aggressive political course in mind. The second panel “25 Years Promoting Market Economy” focused on the fluctuations in the transition period from an economic point of view. As Svetla Kostadinova, Executive Director of the Institute for Market Economy, underlined, there are a lot of myths about the Bulgarian economy, but, unfortunately, the transition will continue to be on the agenda over the next 25 years, “simply because it has not been implemented in the right way from the very beginning”. Kostadinova made it clear that in 1996-1997 Bulgaria fell into its most severe economic and financial crisis, due to the wrong interpretation of market economy and the extreme state regulation over the market. “In the following period, the reforms have been unreasonably postponed or not implemented at all,” she continued. These circumstances hampered the development of investment climate, the establishment of small and medium-sized enterprises, the opening of job places, and the expected substantial increase of the standard of living. Such experiences shared Bertram Rollmann, one of the first German investors, whose garment production business in the country extends back to 1992. In fact, entrepreneurship was pointed out as the engine of economy and the economic growth by Nikolay Vassilev, Minister of Economy (2001-2003), who explained that Bulgaria has great potential, if liberalises its economy. “Successful reforms in the communications sector allowed Bulgaria to take the lead in the world rankings of services into that sector,” Vassilev stressed upon and affirmed that this could be done in other sectors of the economy as well. Bulgaria needs to speed up with all these reforms because Europe and the world are in an ever increasing competition for brains and talents. “People dream of a better world which, however, is not happening. If they see clear perspectives for the future, they will desire to stay and not to leave the country,” Prof. Paqué stated, giving a strong sign that precisely the initiative and highly qualified young people of Bulgaria will be the engine of further positive change. movements, civil organisations, and activists who strive to bring a perceivable change for prosperity and freedom in Bulgaria.